I can put this one in the bank! Hello bakers, I was wondering if There are any tricks to getting a deep brown color without burning the bottom or over cooking my breads. I have a double oven and find the larger bottom oven browns slightly better, but still no great shakes. Thanks, any help you can offer is always appreciated. Are you steaming your oven? If not, that will certainly help. In the creation of a sourdough or levain culture, there is another consideration. If the water used is highly chlorinated, the chlorine can have a negative impact on the culture. In this case, simply leave a bucket or jar of water out overnight, uncovered. By the next day, most all the chlorine will have dissipated. This used to be the cure for de-chlorinating water but most US municipalities have move away from free chlorine (which is water soluble) to Chloramine which is a more stable disinfectant and can't be removed by the traditional tricks. I learned about this from breadbaking's more roudy cousin, beer brewing. Where water quality is of supreme importance. You can remove Chloramine from water with potassium metabisulfite which can be acquired through home brewing suppliers. Do you spritz water in once a minute for the first 3-5 minutes? I do this as well as the water in the pan. Also when you add the water to the pan, are you doing this before or after you put the bread in the oven? It should be the last thing you do before shutting the oven door. Yes I pour the water in the pan after the bread is in. I do not spray for fear of opening and closing the oven door would lower the oven temp to much. I like to start my breads at very high temps for the first ten min. If your lower oven coils are working the the top coils not, then you might have problems with burnt bottoms and pale tops. (No mention what kind of oven but I'm guessing it's electric.) Is your oven heating up to the proper temperature? Have you checked it with a separate thermometer? Or try moving the rack up and raise the temperature of the oven. Steam improves color, so does a long ferment (try using less yeast) or adding a little sugar. Over kneading the dough can lead to pale loaves. You could also try "cooking" it longer. A great quote from someone on this site, "if you think it's brown enough, let it bake another 5 minutes." The ovens are gas fire. I check the temp. with a digital meat thermometer. and it heats up fine. The bread I am having trouble with is a fast ferment so that my be part of the problem. I posted pics of the Ciabatta I made yesterday on the artisan bread board any feed back would be great. because all the natural or added sugar in the loaves has been eaten up. If you are sure your oven temps are accurate and you doing all the above suggestions right, you might try enhancing the color. One way is to dissolve a small amount of sugar into some water (about a tablespoon in a cup of water should do it). Put this into a spritzer bottle and spray the loaves just before they go into the oven. The tiny bit of sugar will enhance browning on top. For sweet breads and dinner rolls, you could also brush the tops with milk or egg, either whole or whites or yolks. Any of those will enhance browning. I think it might soften the crusts on hearth breads, though. Your Ciabatta looks over-proofed to me. Even if you follow directions exactly, the dough's requirements will change depending on how carefully you control for temps. I get beautiful rich red brown loaves by baking my loaves under stainless steel bowls that have been rinsed with hot water and left wet. After twenty minutes the bowls come off and I slide a baking sheet under my bread pans to keep the bottoms from burning, which they will certainly do otherwise. Thank you all for your input. After reading all the comments I came to the conclusion that over proofing is the most likely suspect. I proofed the dough in a heavy glass bowl that holds 14cups of water to the rim. I started with 500 gms of flour @ 95% hydration. After looking at the dough on the bottom of the bowl I estimated that triple would bring me to about the top. Jason said two and 1/2 hours It took mine 1 1/2 hours to reach that point. How high in that 14cup bowl would you think 500 gms of flour should reach to be tripled? It was 69f in my kitchen that day. I Don't have the time today but I am going to experiment a bit to see if I can perfect this bread under my conditions. First I am going to use less yeast to make for a longer proofing time. Next I am going to add a little sugar or honey to the dough and a bit of dry milk powder also I will start with a over night biga. 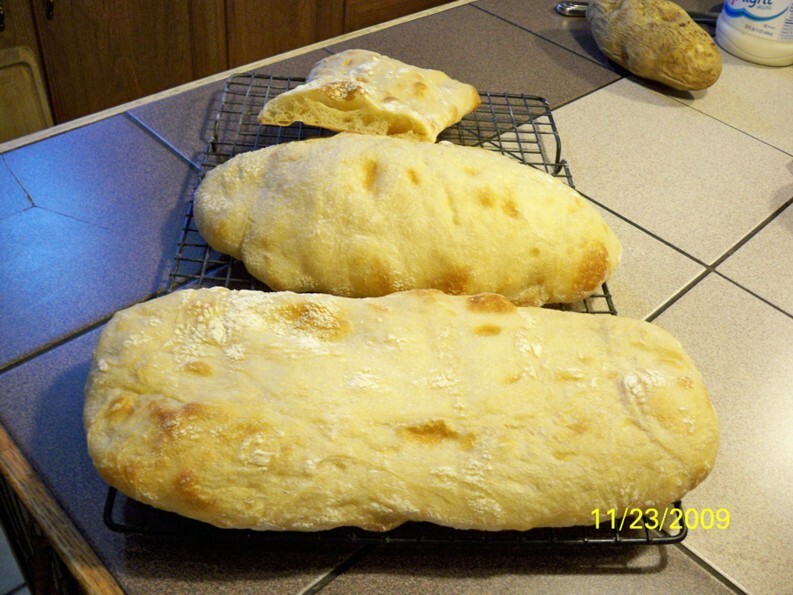 These are elements that are in another Ciabatta recipe i have used from k. A. bread site. The bread tastes good but I am determined to get it perfect. After all this is the artisan bread forum. Let the experimentation begin! some other observations At the start of the dough making it was supposed to look like pancake batter mine looked a lot thicker but it came together into a nice albeit very wet dough. do you think i should go to 100% hydration? today the temp in my kitchen is 78F what is the best temp for proofing? Thanks for any help its always appreciated. Buy a couple of clear plastic storage bins that are the right size for small and medium batches of dough, and make sure they have vertical sides like a box. This is what I use when I need to measure volume for things like Jason's ciabatta. I put a strip of masking tape on the side of the plastic bin, drop the dough in, mark the beginning height and put additional marks for double and triple volume. Makes it very easy to see how far the dough has risen versus, say, the clock for example. I got my bins in the kitchen section at our local Fred Meyer store. I have only ever made Maggie Glezer's ciabatta, which is 105% hydration as I recall. If you are comfortable with pancake batter, go for it, however Hamelman's ciabatta is I believe only 73%, so I don't think hydration is the issue here..
76 degrees is an ideal rising temp according to Jeffrey Hamelman but 68-80 will do fine. It's just that you need to watch your dough and learn to judge when it's ready under the conditions in your kitchen. 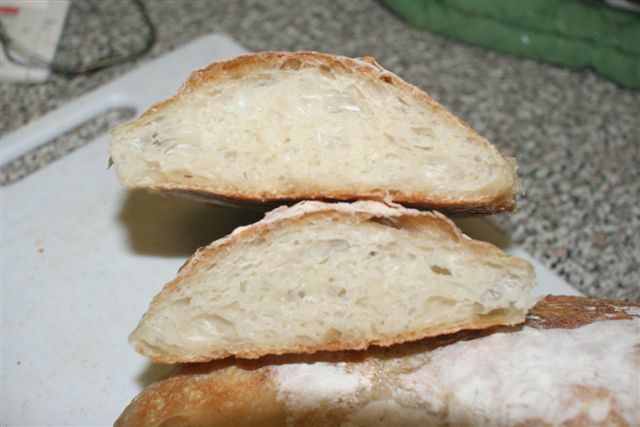 A fully risen but not over-risen dough will be light and airy; especially with a ciabatta you will probably have big gas bubbles forming under the surface of the dough, but it should still have surface tension. You don't want it to begin deflating on its own. Push on it gently with a finger and it should fill back in slowly, not deflate and not bounce back quickly either. You can use the honey and milk, that will certainly help the crust brown but you should be able to get a golden glow just fine without them. The biga and a little less yeast are a good idea as well, since you are getting such dramatically different rising times. Good luck! for your advice, Happy thanksgiving. I will post back and let you know how it turns out. The part that confuses me is it needs to triple and still not over proof. The tripling is equivalent to the first rise. It is essentially degassed(somewhat) after that. But even if it hasn't tripled you must't let it overrise, you'll lose more than you gain. I'd say don't fret too much about whether it's precisely tripled as long as you've got a good looking dough in every other respect. This is such an informative thread with some of the issues I have been having with the same recipe being a novice. Thank you Will for starting it and please keep us posted with how you fare. I think that it’s the right thing to do, to work on one recipe that holds promise until you get it to work great every time. This proofing thing has gotten me stumped. Because my kitchen temperature varies widely and not knowing what end-result-proofed should look like I can’t tell if the dough is under/correct/over-proofed. Just kind of winging it and the bread lacks height. I don’t know if this is from under or over proofing. As for the second proofing I pushed my finger in to test. The dough was so slack/stick that it stuck to my finger and came out with it a bit (in gluten-like-strands not like un-kneaded sticky dough). Then the surface of the dough sealed back on itself as if nothing happened and there was no indentation. The dough was very bubbly with big bubbles and there seemed to be surface tension. When I baked it there was almost no oven-spring at all. So was this over- or under- proofing? A tell tale sign was there was a big rise in the center but none at the edges. I read here somewhere that this is a sign of under-proofing? Are there any secondary characteristics to tell if the dough is correctly proofed in the first and then the second rise? And caltrain: Thank you for that information about water. First, it would be better to let your dough rise a little too short a time than a little too long even for the first rising, or fermenting period. Your sugars are getting eaten and your yeast is getting tired just as you described, and that will make a golden brown crust and good shape to the final loaf a little less likely. Then, try wetting or flouring your finger for the poke test if your dough is slack or sticky, so you can judge better. It's kind of hard to describe how a properly expanded dough looks/feels other than the poke test and a light spongy feel if you aren't afraid to lift a corner. It really should be able to hold up to a little handling and still retain its shape. Very over-risen dough will deflate and collapse like a balloon if you look at it sideways. I would expect you to get quite a bit of ovenspring from a slightly under-proofed dough, just a less open crumb from the finished loaf, and still good color and taste. If the center is higher and the edges slack I would think the dough might not have been developed enough, maybe needed another stretch-n-fold and it might again have been over-proofed, particularly as you say it was very gassy and bubbly. Gassy and bubbly is great in a Ciabatta dough, but next time try to catch it a little earlier. Every time you make bread you will learn more about how flour and yeast behave under your conditions. Nothing beats the hands-on approach, keep at it! 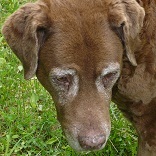 browndog....thank you. I am working on it. Keep every one posted and more likely than not I'll need move advice. After watching the Youtube vid of the women making this exact bread, I have decided to try and work it out as is. Then when I get it down pat I'll make some changes to make it my own. hopefully I can make some bread tomorrow. Thanks again. Flour, yeast, salt and water is cheaper that therapy! LOL I get a lot of pleasure from baking bread. Be the the bead slow down rise slowly, rest then get that spring in your step and glow all over! Hello again I did it! It turns out after watching a chef on YouTube make Ciabatta My dough was grossly under developed not over proofed. I used the same formula except I made it 100% hydration & also I could not resist adding a little honey. After the dough cleared the bowl in the mixer, it went into my glass proofing bowl for 45min. Then a stretch & fold in the bowl and another 45 min. I repeat that three times for a total of about three hours Then I dumped the dough on the counter formed the loafs into the pan & rest for 20min. Then in the oven lots of steam for the first 5 min. & cooked about 35min total. This is what i ended up with. I am happy with the result. any feed back on the loafs is welcome positive or negative. Nothing to add but the olive oil for dunking in-! Beautiful! It was your comments that got me thinking more about how the dough looked and felt. instead of if it tripled. My dough was blowing up quite fast but I think it was all air and not added volume. In any case If I can duplicate these results a few times I will be confident with high hydration doughs. Thanks again. Will, ever hear the expression... "No guts, no glory!" ...? Bravo!!! Burnt? I don't see burnt... Crumb shot? ...oh and a dip shot please! those are absolutely amazing! you set the bar very high for me! I just made these again the other day. The dough tripled, but it was getting late so I stirred it down and put it in the fridge for an overnight rest. By morning it had almost triped again. 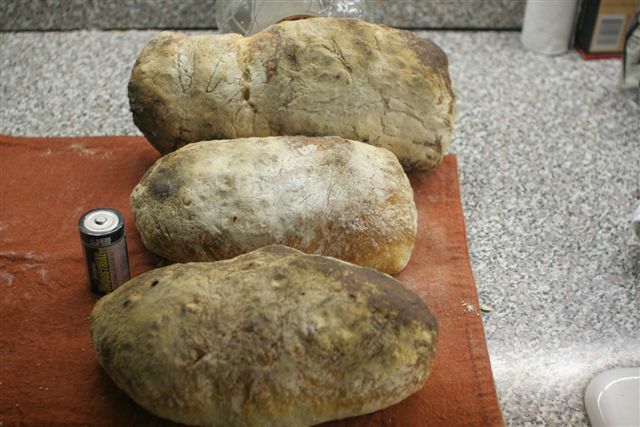 I waited for the 'triple" then I shaped the loaves (3) and put them on a floured towel while I preheated the oven. I baked them in 3 bakes. The first one I put on parchment lined, floured cookie sheet and covered with a tin foil pan misted with water. It came out pretty good. First 15 minutes covered. 2nd one I didn't deflate as much when I put in IN a parchment, floured tin foil pan. Misted the dough and covered with a misted cookie sheet. That one really puffed up, but I think it's mostly air that makes it look puffy. I haven't cut into it yet. 3rd one - same technique as the second one, but again it kind of deflated when I flipped it over into the pan. I was happy with all three. The best part was the overnight rest in the fridge. I now know I can make the dough the night before, stir it down, put in fridge and resume where I left off the following morning without dire consequences. I always seem to get started on this stuff late in the day and then get too tired to continue. I may try adding some diastatic malt powder or honey next time and see how that works out. THe one thing I make SURE to do is to mix the dough and then BEFORE adding the salt - let it rest for at least 10-15 minutes. Then add the salt. That makes a world of difference for me when it comes to the dough gathering in the bowl. Before I started doing that - it would take forever to get it to come off the sides and bottom. Now it takes about 1/2 the time. The cut one is the first, the puffy one the 2nd and the full, flat one is the 3rd bake. After reading thru this thread, I think I'll try the stretch and fold and see how that works out. thanks for the tip. HI Susie, Thanks for the complement. 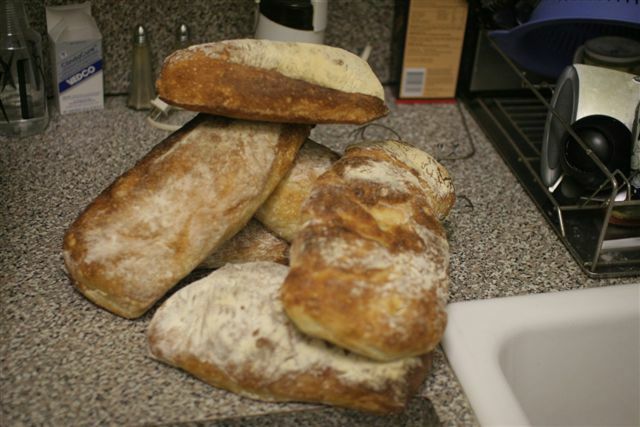 I made the Ciabatta again sunday with the same great results. For me the trick was the 45min rest then streach & fold. I was a little more agressive with the streach and fold the last two times & you can see from the pics how much more pop I got. Sundays loafs were ready after onlt two streach and folds. The poke test works well with a wet finger. You can see the dough follow your finger right back up if its not quite there. Then when its good to go it will leave a little hole. Your loafs look like mine did before i worked it more after the mixer. Good luck. Did you flip yours onto the baking surface? That seems to be my downfall. I'm going to make this again within the next few days and use your S&F technique in the oiled rising bowl. When I 'stirred' down my dough before putting it in the fridge, it took a bit to stir it down which I found interesting. I thought it would immediately deflate, but it took a bit of stirring to deflate it. I don't remember how it was after shaping, but when I flipped it over onto the baking surface it did knock out some of the air. hmmmmmmmmmm? 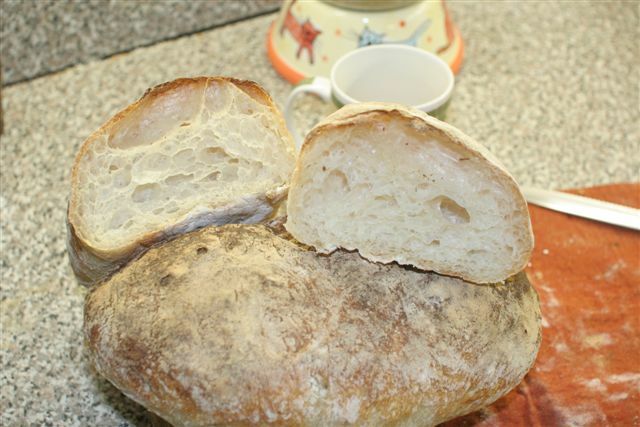 all things considered, it's a great recipe and my hubby who likes 'sponge' bread from the store has even starting making his toast using the ciabatta. Now THAT says something! I've always had really good luck with the Team USA ciabatta from Reinhart's Crust & Crumb. Here's the result I consistently get. What I like most about it is the ease of the build and the incredible structure. Because it has such high hydration, it doesn't rise so much as spread, but you'll get great oven spring and really open structure even if it doesn't double, and you'll find this is a very forgiving recipe. Just use LOTS of flour or this will stick everywhere. Also, I've been making it with a 50/50 mix of high-gluten (13.5%) and AP (11%) flours, for a good blend of chewy and tender. The Team USA recipe was the very first one I ever tried. It was a huge flop (no pun intended). Now that I've made this one - I may go back and try that one again. I made this one with bread flour and no AP. I found that after doing the stretch and fold routine, the dough was not that hard to handle at all and could take a bit of handling without deflating. Here is the exact method I used after the dough clears the mixer bowl. Use very wet hands! OK, that's what I DIDN'T do. 9. rest for 30min then pop into the oven"
I shaped them, on a floured towel instead of on the final baking sheet. Then - right before putting them in the oven, I flipped them onto the pan I was baking them on. had I let them rise on parchment after final shaping - and then transferring to the oven straight from there without flipping them over again, they would have been much "springier" (if that's a word?). It was that last flip that made them flatten out, but according to the recipe, they said to flip before baking to even out the 'bubbles. 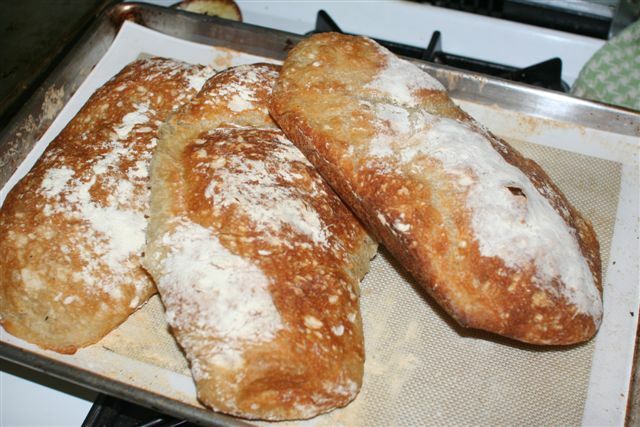 I just made a double batch of ciabatta,(really gave my K.A. Pro 6 a work out) for the forth time in three days the results were great! Even with a slight miss hap with the loafs. Some how i divided the dough only four ways instead of six. After some fumbling around I managed to get six loafs. LOL I am now confident that I can make this bread anytime. I really have to start thinking turkey now so I.ll be on to my next bread after Thursday.